SOUTH HADLEY – Eighty gallons of oil were spilled on Lyman Street near the entrance to the Big Y plaza early Monday morning after a Cumberland Farms tractor-trailer truck jackknifed due to the icy road conditions. The truck, driven by a 47-year-old male from Taunton, hit an ice patch while traveling northbound on the street at 6:53 a.m. When the driver put on the brakes, the back end of the truck jackknifed on the ice. As the back end of the truck did this, it crushed and pierced the driver side fuel tank. Eighty gallons of diesel fuel seeped into the road before the leaking liquid could be contained. South Hadley Police and Fire District 1 responded, along with the Massachusetts Department of Environmental Protection [MassDEP] and two cleanup crews. Unfortunately, the oil leaked into a nearby catch basin, which is part of an unnamed feeder brook that eventually feeds into Buttery Brook. “With the rain, it was so hard to control it,” said Mass DEP Environmental Engineer John S. Bourcier. According to Cathy Skiba, MassDEP regional spokesperson, a vacuum truck was used to recover the spilled fuel from the catch basin. Absorbent pads were put into the brook to “capture any residual that may have escaped,” she said. On the roadway, clean-up crews laid down “deep water” and “sausage” booms in an effort to contain and absorb the spilled fuel in the roadway. 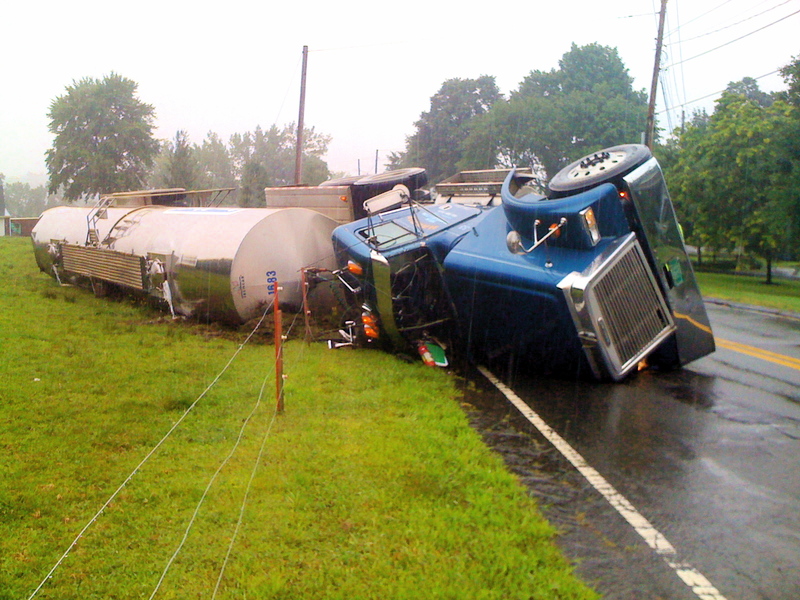 Approximately 50 gallons of the spilled diesel fuel were recovered. Booms from the road have since been removed, but those in the brook have been left in place. Skiba said MassDEP will follow up in the future to make sure there is no residual diesel fuel left in the brook. 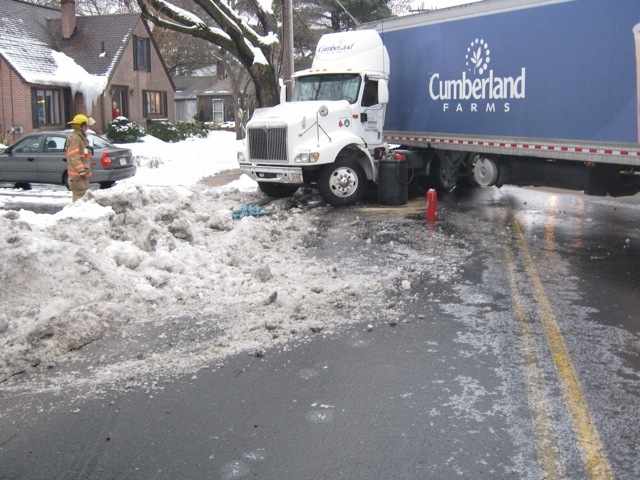 The driver of the Cumberland Farms tractor-trailer truck was not hurt, however, his 23-year-old male passenger from Providence, RI, had to be transported to Holyoke Medical Center for minor injuries he sustained during the accident. 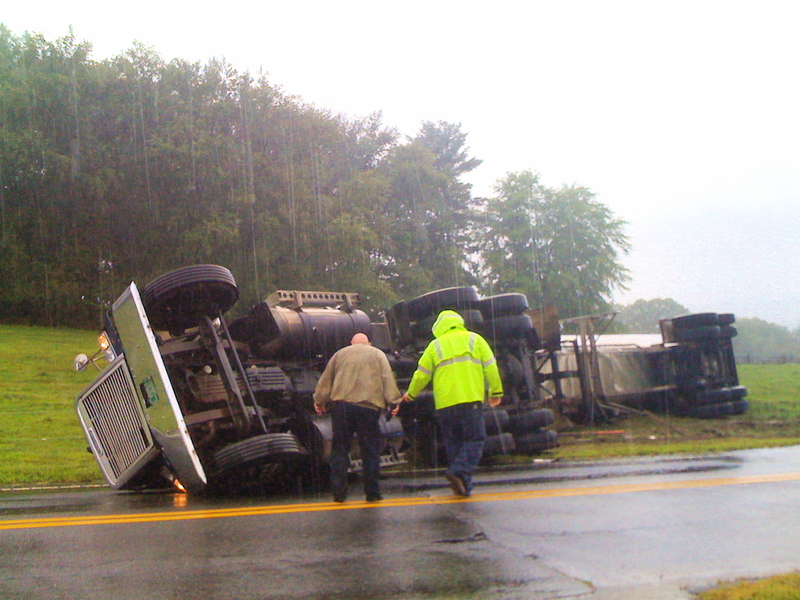 Additionally, a second accident occurred as a result of the tractor-trailer truck jackknifing. A vehicle driving behind the truck saw it losing control on the icy street and skidded off the road as a result. The driver of the second vehicle was not injured.